You will need to bake your favorite cake recipe and bake it in round pans. Let them cool completely. 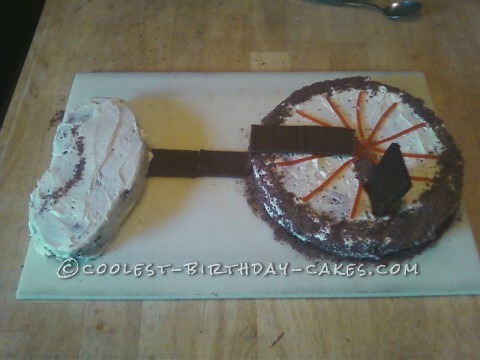 Leave one half of the cake round, the other half cut into the shape of a unicycle seat. Next, arrange on a large cutting board as far apart as possible. Frost with your favorite white frosting, (butter cream, vanilla, cream cheese etc.). Now for the candy. Peel apart some Twizler pieces and cut/arrange like spokes. The pedal is a large dark chocolate Hershey bar broken to the right size. The pole connecting the wheel to the seat is sections of milk chocolate Hershey Bars. The tire is the other half of the dark chocolate bar grated. Make 3 to 4 times the amount of chocolate shavings as you think you will need as it is hard to get them to stick to the cake before they stick to you. My daughter’s unicycle also has a stripe on the seat, so she added that with some more of the chocolate shavings.